You've now entered the Blackjack Zone. 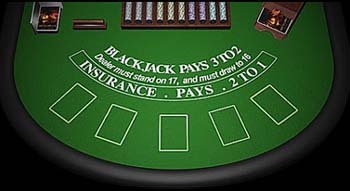 In it, is the blackjack table - a semi-circle, and usually with padded edges and space for up to seven seated players to lean on as they play. Some tables actually seat only five or six players. At the table, the dealer stands opposite the players at about where the center of the table circle would be. On the table in front of the dealer you'll see a tray of chips of varying colors, with each color represent a particular dollar value or denomination. In terms of the design of the table, it's surprisingly simplistic, and will most likely include only betting circles for each player and two lines of lettering outlining the house rules. The next thing for you to look for in the blackjack zone is the time of game that's being played at the table. While the standard at most casinos is for six (or sometimes eight) decks of cards to be shuffled and dealt from a rectangular wedge-shaped holder called a 'shoe', there are places in Las Vegas for example where you can find two-deck or even single-deck blackjack being shuffled and dealt by hand by the dealer. With that said, before you play blackjack (whether online or regular casino blackjack), it is important that you know what you're getting yourself into with regard to the particular blackjack zone that you're in. This includes knowing the number of decks being used, how they're being dealt, house specific rules that you should be aware of (for example whether or not the player can touch the cards) and last but not least important, the specific betting limits for the table. Most of these questions can usually be answered by simply reading the posted signs (if any), asking the dealer or even taking a few minutes to observe a game for yourself.